Finallyâ€¦a DVD from Mark Russell! Mark Russell incorporates the in-hand exercises developed by the classical masters into his own training program to relax, supple, and strengthen the horse in educated postures. 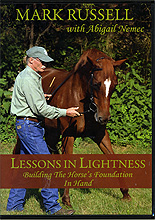 Mark expands on his book, Lessons in Lightness: The Art of Educating the Horse, and his DVD, Riding with Chi: Your Pathway to Energy Mastery, by demonstrating the techniques he uses to teach the horse to respond with lightness to the aids. His methods are accessible to riders from all disciplines. Abigail Nemec, Director of Equine Studies at Post University in Waterbury, CT, joins Mark to examine the gymnastic and biomechanical value of each exercise. Using skeletal and muscular animation, Abby makes the complex issues of biomechanics easy to understand. She also demonstrates how riders can improve their body language and posture to achieve a high degree of success when incorporating Markâ€™s exercises into their horseâ€™s training. Mark Russell is the consummate horseman. It is sometimes difficult to describe the depth and breadth of his understanding of the horse. Evidence of it emerges when one watches him approach the horse. A subtle communication, a touch on the neck, or as one student stated of her horse: â€œshe just melted in his handâ€�. One would think that is the beginning, but for Mark, the connection developed some time before the rest of us noticed. A master of equine biomechanics, a former student of Master Oliveira, a practitioner of the nearly forgotten Classical Teachings of the past, an expert in and occasional critic of current Natural Horsemanship constructs, a beneficiary of the wisdom of Tai-Chi; all scratch the surface of Markâ€™s knowledge. His layers of experience and insights seem never-ending and even now he continues as a perpetual student of the human and horse. For Mark, each path deepens the understanding of the other. Mark is unique indeed; his quiet energy, his calm demeanor, his wealth of knowledge, all expressed while he teaches both horse and rider make him a popular teacher and clinician. Mark Russellâ€™s credits include authoring the highly acclaimed book â€œLessons in Lightness: the Art of Educating the Horseâ€�, he has recently released his first training DVD â€œLessons in Lightness: Building the Horseâ€™s Foundation In Handâ€�, he is featured in the DVD â€œRiding with Chi: Your Pathway to Energy Masteryâ€�, and he has been featured in a variety of equine journals.